"Mom, I can't walk right any more. They tell me I'll have to use this cane the rest of my life and that it will only get worse. And one third of the other kids in school are also going around with canes or crutches. They said that I inherited this, but you and dad aren't crippled. My grandparents aren't crippled. I don't understand this. What's happening to me?" Wouldn't you be asking questions and demanding answers? Wouldn't you go to the school and the doctors and insist on knowing what they mean by saying this is inherited? Wouldn't you be going on the Internet to search for information and maybe starting support groups for the parents? Wouldn't you be wondering how your child, perfect in every other way, could suddenly become a cripple at such an early age? And you would be right in seeking answers. "Mom, I can't see the words on the board like I used to. Everything is blurred. They say I am nearsighted and need glasses. They say I'll have to wear the glasses the rest of my life and that it will only get worse. And one third of the other kids are already wearing glasses. They say that I inherited this, but you and dad aren't nearsighted. My grandparents aren't nearsighted. I don't understand this. What's happening to me?" Shouldn't you be seeking answers, as in the previous example, about how it can be that your child, perfect in every other way, could suddenly become a visual cripple at such an early age? But that is not the typical response of a parent. A typical response might be, "Son, the doctors know best. We'll go to town tomorrow and buy you some glasses. I'm sure you'll get used to them." Why this paradox? The choice is yours. Will you make the right decision? And what's wrong with this ad? 1. Are you aware that many researchers are convinced that prolonged close work causes myopia? 2. Are you aware of evidence that increased computer use is contributing to more children becoming nearsighted? 3. 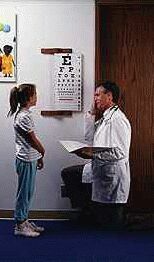 What proof do you have that the distance glasses that are usually prescribed won't make my child's vision worse? 4. Doesn't reading in poor light make the eyes focus more and cause myopia to increase? 5. Shouldn't my child hold the book as far away as possible to relax the focusing muscles? 6. Isn't it true that allowing myopia to develop increases the risk of retinal detachment and other serious eye problems? 7. Would you read www.myopia.org and give me your comments? 8. Wouldn't it be a good idea to refer parents to that web site so we can become aware of our choices? 9. Have you ever prescribed plus power reading glasses for a child to prevent myopia? 10. Will you prescribe plus power reading glasses for my child or do I have to go somewhere else?